It's the end of the year and the end of an era at a Phoenix school. Creighton Elementary School campus is getting a $20 million makeover this summer in a transformation that goes far beyond new buildings. It's been a staple in Phoenix since the 1880s. The now bell-less tower on campus near McDowell Road and 32nd Street is just one of many nods to Creighton Elementary School's deep history. 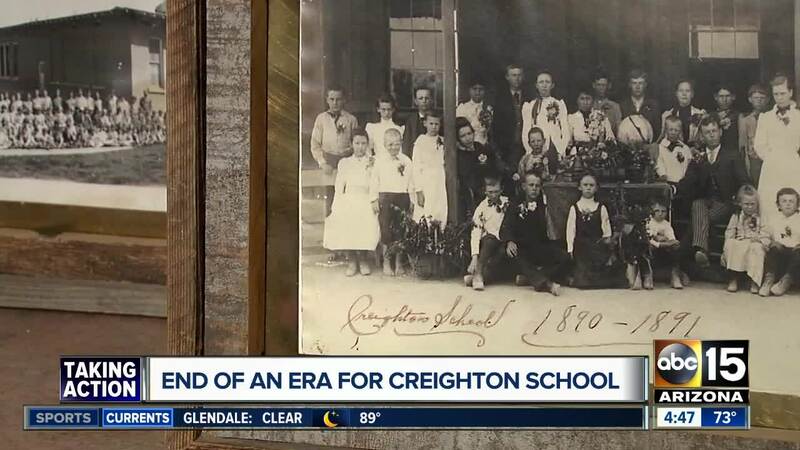 "This is the campus where the story and the history of what is Creighton today started," said Principal Carbajal. "We carry that badge with pride and honor." Over the years tens of thousands of kids have come and gone. Even ABC15's own meteorologist Iris Hermosillo once walked the hallways. This year, seventh graders spent the last weeks of school leaving their own marks on one of just two structures set to stay on campus. "I've had grandkids of students that I've had," said Sue Kendrick, who has taught in the district for 20 years. "They feel connected; they know it's a safe place and they can come back and visit us." Some of those students even come back as teachers. "I remember my former teacher wrote, 'If that's your dream, you can accomplish it.'" said Ruth Barrera. "That's what stood in my mind throughout my education and I did it." Barrera teaches first-grade now but attended Creighton for kindergarten through eighth-grade. It is not easy packing up a campus that's been around since the 1880s but staff and students have been doing just that for the past several weeks. "Sadness, obviously, I've been here for so long and you're used to the building and let's be honest, you're used to stepping over the cracks and you're used to, 'don't go there because it smells right now,'" said Kendrick. Carbajal also feels some sadness walking the halls but says the old campus is now ground zero for a brand new teaching philosophy. "It's where the history and the new philosophy is merging and fusioning (sic) to give the next step to better serve our students and our families," said Carbajal. The new Creighton is trading the traditional four walls and rows of desks for flexible learning spaces. Open, shared areas designed to help students innovate, explore, work together and ultimately better prepare them for the future. "We want to provide spaces in which the students can talk and collaborate and solve problems and use those critical thinking skills we work so hard to teach them and have them apply," said Carbajal. Still, even as the old walls come down and new ones go up, their message for students will stay the same. "No, you're not working in a place anymore that is just sub-par," said Kendrick. "You get the top and you're going to reach for the top." An $85 million bond passed in 2016 is helping pay for this massive project. Students and teachers will spend next school year at three different schools in the district before returning to campus for the 2019-2020 school year.